Looking for sports management? We got your back. You're already a winner. Let us make you a legend! 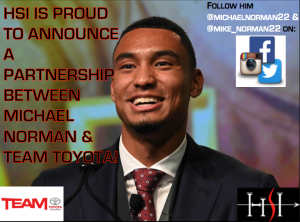 Michael Norman partners with Team Toyota ahead of the 2019 season! In Our Third Decade of Supporting the Best Talent in Sports. Founded in 1996, HSInternational serves as a vehicle for world-class athletes to receive specialized management, career guidance and counseling. Headed by Emanuel Hudson, Esq., HSInternational represents talented and accomplished professional athletes. HSI’s philosophy is based on the principle that we are employees of our clients. We are here to carry out and support their career objectives as trusted advisers. We help you succeed together.